Generally speaking, when you think of Mizuno forged irons, you think of the user as a single-digit handicap player -- someone who knows his way around a set of forged irons and how to use them. 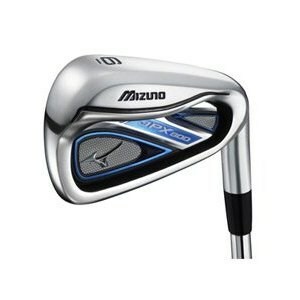 Well, the JPX-800 set from Mizuno attempts to bring their famous forged iron feel to the mid-to-high handicap crowd. These are a serious player iron -- designed to be both very forgiving and very long. The JPX-800TM is the first model to bring Mizuno's JPX technology platform to the United States. The distance inherent in the JPX-800 irons is the result of combining their MAX COR Technology, Hot Metal Face construction, and an exotic pocket cavity to reach the maximum allowable limits for energy transfer (COR or Coefficient Of Restitution). The COR is the spring effect that the club possesses. Like a trampoline, it makes the ball leap off of the face like a drop of water hitting a hot oiled skillet. The USGA has set a maximum on the Coefficient of Restitution so that it doesn’t get out of hand. Without getting into the actual formula (I was told there wouldn’t be any math) club makers, like Mizuno, have pushed it to the max. In addition, Mizuno has long been known for their metallurgy technology, and the "Hot Metal construction" utilizes a new manufacturing process that increases the natural strength of the club head material to create an ultra-strong and yet multi-thickness face for consistent ball speed. The JPX-800 also features a "pocket cavity" (which is a bit reminiscent of the TaylorMade Burner Plus irons) with an external power bar design. This design expands and extends the sweet spot and lowers the center of gravity (CG) for some pretty remarkable forgiveness. If you have ever mis-hit a forged iron, then you can appreciate what this means. Rather than feeling like you hit flagpole with a pipe wrench in 20-degree weather, you actually get some good vibes, even on those mis-hits. The sole of the JPX-800 has been triple cut (essentially, rounded off) to ensure a solid ball/club strike from all types of lies. The set consists of a 4-iron through Pitching Wedge (PW) and a Gap Wedge (GW) for a total of 8 clubs. Shaft options are either the Mizuno Graphite Exsar IS4 (Regular flex) or the True Temper Dynalite (in Regular of Stiff flex). As is often the case with forged irons, the JPX-800 is available in Right Hand orientation only. The manufacturing process for making forged irons is very expensive (and the price of these clubs reflects that) and offering them in a Left Hand version is rarely done. These are a striking looking club -- with clean, simple lines -- that will appeal to nearly every level of golfer. If you're a mid-to-high handicap player and would like to try a forged iron that will still give you serious game improvement features, you would do well to take a close look at the Mizuno JPX-800 Forged iron set. If you are in the low-handicap range, take a look at the JPX-800 Pro set.